This post contains affiliate links, which means if you click through and make a purchase, I may receive a small commission at no additional cost to you. I never recommend any products that I haven’t tried or wouldn’t use, myself. God wants us to tell our stories. God has given the same instruction in Exodus 12: when your children ask you the meaning of the Passover, answer with the story! And, we see the same directive again after the Israelites cross the Jordan River in Joshua 4. Revelation 12:11 says that Satan, (the accuser), will be defeated by Jesus’s blood and by the word of our testimony. Our stories are powerful, especially when Christ is at the center of them. 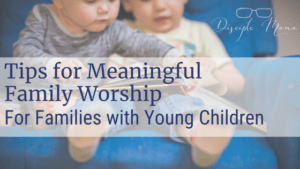 The stories of our past can help our children learn right and wrong, feel connected with older generations, and most importantly, learn how God has led their family before–which helps them understand that He can still work in the present! One study, by Emory University, actually began with recording family dinnertime conversations. They found that, as you might expect, all the families studied spoke about whatever had happened to them earlier that day. But, they also found that many families discussed earlier stories. They brought up shared stories of family outings or travels, and parents told stories of their own childhood events. The study found that these family stories, especially when the mother told them, actually had positive effects on the well-being of the children! Kids, aged 9-12, who typically heard these family stories actually had lower instances of internalized issues like depression and anxiety, and externalized issues like aggression and anger. The kids who didn’t hear the family stories, but heard other kinds of stories or just chatted about the day’s happenings didn’t have the same positive outcomes. Family Research Labs have asked adolescents to tell stories about their parents, and then gone to the parents and asked them to tell the same story. The parents, evidently, are often surprised that their child remembered the story at all, because they didn’t think that the child would remember it for so long, or they just didn’t think the child was listening when the story was told. Parents, you know what that means, right? The stories you tell from your past will help shape your child’s personal identity! And that’s what we’re after. No, that doesn’t mean that we’re trying to turn our kids into the new us. 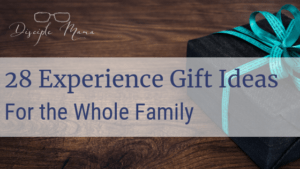 We want to give our children a strong family identity with members that they can relate and connect to as they form their own personal identities. The stories don’t need to be limited to immediate family, either. Your kids can connect to stories told by and about their grandparents and other extended family members, too. In fact, it’s helpful to show, through storytelling, how you learned from your parents. One of the most tempting things to think, for many of us, is that we don’t really have a good story. I know that, when my son is asking for yet another story from “when you were a little girl, mommy!” I often have trouble thinking of something to tell him. But everyone has a story, and your story doesn’t have to be an epic tale of tragedy or triumph. Try not to fall into the trap of saying, “I don’t really have any good stories to tell.” Instead, find the story in the little things. If you’re really at a loss, tell the stories that your parents or grandparents told you. It’s fine if you’re just telling your kids about what your everyday life used to be like; kids can relate to everyday life! Telling stories that connect our lives to our kids’ lives is what it’s all about, so don’t worry about making it sensational or thrilling, it just needs to be about you (or other family members). 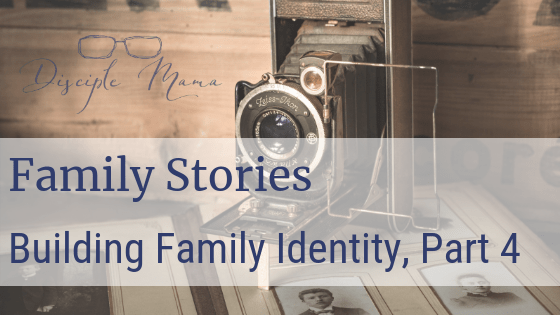 Of course, if stories are this influential in building family identity, and, thus, helping our kids build personal identity, we need to be intentional about how we’re telling our stories. 1. Don’t always make yourself the hero. We are our children’s heroes, especially in the very beginning. That’s great, because parents are the first example of God’s love that our kids experience. But, especially as they gets older, it’s important for our kids to understand that we’re not perfect, and it’s probably equally important that they see that we don’t think we’re perfect, either. It’s okay to reveal your imperfections in the stories from your past. Tell about the time you broke your mom’s vase playing ball in the house. Talk about how you got caught lying about who took a bite out of the freshly baked cookie. Your flaws make you relatable to your flawed children. Of course, you can tell stories about how you were the good guy, too, but take every opportunity to make sure your kids know that God is the real hero in your stories. 2. Don’t forget to tell what you learned from your story. After you tell your story about how the chocolate all over your face gave your cookie thievery away, let your child know what you learned (or should have learned) about telling the truth! For some reason, it’s easy to tell stories of youthful misbehavior as cute or funny, but that’s not exactly the message you want to send to your kids. Use your stories to help your kids draw connections to their own mistakes and how they can be learning experiences instead of failures. You can talk about how you’ve experienced forgiving and being forgiven, or about unconditional love and how you’ve experienced it. No matter how interesting or important your story is, don’t tell it before your child is ready. My 3 year old has been frequently waking up with bad dreams for a few months now. He’s loving stories right now, too, so Disciple Dad and I have been scrambling to come up with enough personal stories to keep him satisfied. Even so, this is not the right time to tell him the story of the earwig that crawled into my sleeping husband’s ear. You can tell sad or tough stories, just be aware that your little ones, especially if you’ve been avoiding tv and videos, are not desensitized to sad or scary ideas like most adults are. They’re really internalizing the stories, and their imaginations are vivid, so these real-life stories with characters they know and love will be very real to them. How can we share our family stories? There are many ways to tell stories about your family. You can tell your child stories from your past early and often! 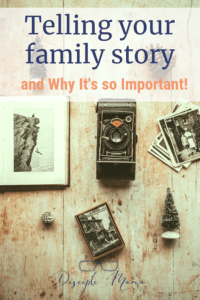 Telling family stories is a really great way to spend time together, it works in the car, in the grocery line, in waiting rooms, and it requires no supplies. Of course, other than standard storytelling, you can use unique family items and characteristics to tell your family’s story. A look through old family photos can be a great way to tell family stories to your kids. Children love to look at pictures, and you can talk them through the different memories commemorated by each photo. Haul out the old photo albums and let the nostalgia commence! You can also make new photo albums of your last family vacation or an important family event, which, of course, will require prints. My husband (who’s a great photographer), prefers to order his prints from Adorama, but Costco is also on his good list for prints. If you’d rather not order prints, designing a photobook online is another great option. There are countless sites to do this. Adorama has some great options, and so does Snapfish, and if you’ve never used Shutterfly before, you can click this link for a free 8×8 photobook (I think you’ll still have to pay shipping). Heirlooms can be a lot of fun, too, and I don’t just mean antique furniture and very valuable items (though those are nice, if you have them). An old family Bible is awesome if you have one: it’s wonderful to be able to look through it and see the names of family members, and their notes or underlined passages. I don’t actually have an old family Bible, but thinking about it when E was a baby inspired me to think of my Journaling Bible as an heirloom in the making! I want to be able to share what I’ve learned about or what I’ve had more questions on as I read and study my Bible, and I want my kids and grandkids to eventually add their own notes, questions, and illustrations to my Bible. Another heirloom that is really fun for my boys is that my mom has given us some toys that she used to play with when she was a little girl. They’re still in good shape, and it’s great to have that connection with their Grammie! She has also given us little hats, mittens, and boot socks that were knitted for her, and are still in great shape today! They keep my boys warm, and E thought it was pretty cool that he was wearing her old hat the other day. My mom got to tell the boys about how she got dressed to go play in the snow when she was little, and they found the story totally relatable, because they were doing the same thing with her stuff! A simple family tree can be a fun way to visualize your family and can help tell your family’s story, too. As kids get older, you can extend the family tree further from your nuclear family and keep learning! Genealogy might not be for everyone, but you might be surprised at how much fun kids can have with it! You can do a basic family tree on paper on your own, or you can work with a website like Ancestry.com (which has free and paid options) to find out more about your extended family. Make sure you talk about how Jesus is a part of your family tree! Part of your family story is your religious heritage, so be sure to talk to your children about the cultural and counter-cultural aspects of your family’s Christianity, and how you might do things differently than other people because of your religion. Please keep in mind, here, that raising disciples of Jesus means raising loving people. Discussing your religious culture and beliefs in a way that pits you against people who worship differently than you is not the goal. Our family keeps the seventh-day Sabbath, and we go to church on Saturday, which E has noticed is different than the other churches in town. When we drive by our local Lutheran church each Saturday morning, he notices that there aren’t usually any cars in the parking lot there, and asks us about it. We have explained to him that we keep the Sabbath differently than Lutheran churchgoers do. He still hasn’t realized that Sabbath keepers are the minority in the world, so he thought it sounded very odd to go to church on Sunday, but now he knows that some people do, and he understands a little bit more about our family’s unique identity. Talk about the cultural and ethnic heritage of your family with your children. Celebrate what makes you unique and learn about the language, food, music, and customs of the regions that your family comes from. My husband is Norwegian, and he likes to make lefse for our family to enjoy once in awhile. In fact, lefse is a family tradition that he has shared with me since we got married, and he’s looking forward to our kids being able to try it again this Christmas (now that E’s old enough to remember it!). If your family stories have some less than ideal plot lines, you are not alone. It’s okay. Your kids should still hear them (as always, in an age-appropriate way), and you can use these stories to teach an important lesson about redemption. Most families have been touched by divorce. If that’s the case for yours, when the time is right, be honest with your kids about it. Let them know that the situation wasn’t ideal, but also show them that God can make something beautiful out of something broken (Romans 8:28). Maybe illness or untimely death has been a big part of your family story. Share your sorrow as you feel it’s appropriate, and also tell the story of hope that we have for our loved ones who are sleeping in Jesus, and how everyone will be given a new, perfect body at the Second Coming (1 Thessalonians 4:13-18, 1 Corinthians 15:35-58). And remember, even Jesus grieved over the death of Lazarus, because sickness and death were never supposed to intrude on life. It’s okay to grieve, and it’s healthy to teach our kids that, too. Whatever the situation, whatever your story, remember that Jesus is willing to walk through all the tough stuff with you (Psalm 23:4). No matter what your storytelling style, keep sharing the stories that shape your identity. Your stories have had a share in shaping you and in shaping your family. Share, learn, and grow from them and help your kids do the same. You’ll probably find, as you dig back into your memories, that you will be able to see how God has been consistently moving through your family’s stories. Make sure you’re including Him, not as a footnote on the story, but as the central character. He’s been there all along, and if you show them how, you can help your kids find Him in their stories, too. This is WONDERFUL and right up my alley! I am passionate about identity-building, and wish I had been more in tune with this when my kids were younger! Really, really love this, Brianna! Thank you, Michelle! I’m so glad to hear that you have a passion for building identity! 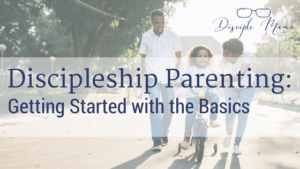 I have a lot to learn about this still, but with God’s help, my husband and I are being intentional with our kids so that they are really growing roots deep into Christ as their identity from the very beginning. Thanks for visiting and commenting, Michelle! Please come again soon! Thanks for sharing some great examples of sharing family stories with your kids. Even though my kids are grown they still enjoy hearing those stories and they continue to learn from them. I still love hearing the stories that my parents, aunts, uncles, and grandparents tell. I think there’s something about our family stories that really fascinates us and holds our interest; that’s what makes them so powerful! Thank you for reading my post, Wendy! Yes, Jesus really knew what He was doing when He spoke to His followers with stories! Thanks for commenting, Tony! I liked the idea of recording the family dinner conversations. I’ve noticed that when the older people in our family share their experiences, all the youngster sit still and listen. My favourite part of this blog post was this sentence: “Don’t always make yourself the hero of your stories”. Well, Edna, my 3 year old loves stories anytime, and especially if they’re about me or my husband when we were young. So, when we tell stories it really helps for us to sort of narrate the lessons we learned into the stories as we tell them. He really soaks them up! Thank you for stopping by and commenting on my blog tonight! Stories are valuable for everyone. Passing them down through generations does establish an identity. Yes, Janice, I agree! Thank you for visiting my blog! Please, come back again soon! Thank you, Donna! I’m glad you appreciated the post. Blessings to you, too, Donna!